We carry Heil's full product line but only have the most common items listed here. If you don't see what you are looking for E-mail sales and one of our experienced staff will respond with pricing and availability. 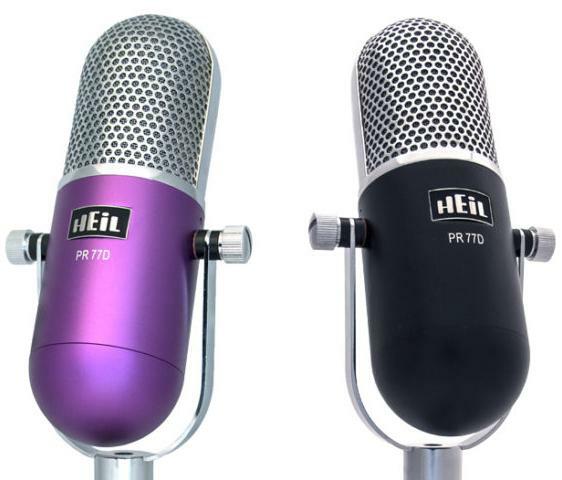 Heil PR-40: The Heil PR-40 represents completely new dynamic microphone technology designed for a wide range of professional applications such as sophisticated recording, live sound, and commercial broadcast. Producing the widest frequency range available in a dynamic microphone, the PR-40 outperforms most condenser microphones, and can withstand huge amounts of SPL. At the same time, it maintains the 25 year Heil Sound tradition of superbly natural voice articulation. Since 1982, Heil Sound has been the leading manufacturer of communications microphones and has a paramount understanding of phasing. When properly applied, this knowledge creates outstanding cardiod patterns with unbelievable rear rejection that removes unwanted sounds that try to enter from the off axis rear. The pattern control of the Heil PR-40 is outstanding. This exceptional performance is achieved by using the ideal combination of materials for the large low mass diaphragm and a special mixture of neodymium, iron, and boron that gives the PR-40 the strongest magnet structure available. These features allow the microphone to achieve magnificent dynamic range. A unique screen system using two different diameter mesh screens and an internal breath blast filter allow the user to talk closely to the microphone with little worry of pops or excessive sibilance. The large diameter dynamic element is mounted in a unique sorbothane shock mount atop a non-resonant fixture, decoupling the element from the massive steel body. This body and the internal hum bucking coil removes any worry of using the PR-40 near monitor screens or noisy lighting fixtures and controls. The new technology of the Heil PR-40 has redefined the dynamic microphone with superior wide frequency response, the lowest presence of noise in the industry, flawless design, and elite quality expected by an innovator and leader in the field. Welcome to the new standard. 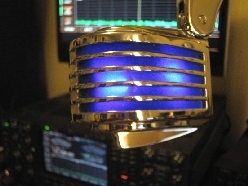 The Heil PR-77D: is a professional quality dynamic microphone for use in amateur radio and pro applications. It is perfect for any application that requires a smooth, flat response over a wide frequency range, excellent transient response, great speech articulation, and low intermodulation distortion (IMD). The PR-77D achieves its exceptional performance via a large, 1-jnch, low-mass voice coil encompassed by a powerful magnet structure using a mixture of neodymium, iron and boron. Special attention has been paid to the phasing plug assembly to provide exceptional 180-degree, off-axis rear rejection of over -40 dB. Simultaneously, the front pattern allows the user to move about freely in front of the element with no change in response. Unique to the PR-77D is a two-position switch allowing the user to select optimal response frequency characteristics between Voice and Music applications. The Voice position rolls the audio off at 120 Hz at -6 dB per octave, whereas the Music position removes the filter and uses the entire audio spectrum of 60 Hz to 16 kHz. The PR-77D is designed to be used exclusively with booms or bases, and has standard 5/8"-27 microphone stand threads. Requires CC1-XLR-x cable for ham radio use. Heil PR-30:The Heil PR-30 represents completely new dynamic microphone technology designed for a wide range of professional applications such as sophisticated recording, live sound, and commercial broadcast. Its smooth, wide frequency range sounds like a ribbon but can withstand large amounts of SPL. Outperforming the tired, 30 year old technology of the industry, the large diameter of the PR-30's dynamic element produces an outstanding upper mid range that makes the PR-30 the absolute best guitar microphone in the industry today, while still an excellent choice for reproducing the human voice. Since 1982, Heil Sound has been the leading manufacturer of communications microphones and has a paramount understanding of phasing. When properly applied, this knowledge creates outstanding cardiod patterns with unbelievable rear rejection that removes unwanted sounds that try to enter from the off axis rear. The pattern control of the Heil PR-30 is outstanding. This exceptional performance is achieved by using the ideal combination of materials for the large low mass diaphragm and a special mixture of neodymium, iron, and boron that gives the PR-30 the strongest magnet structure available. These features allow the microphone to achieve magnificent dynamic range. A unique screen system using two different diameter mesh screens and an internal breath blast filter allow the user to talk closely to the microphone with little worry of pops or excessive sibilance. The large diameter dynamic element is mounted in a unique sorbothane shock mount atop a non-resonant fixture, decoupling the element from the massive steel body. This body and the internal hum bucking coil removes any worry of using the PR-30 near monitor screens or noisy lighting fixtures and controls. The new technology of the Heil PR-30 has redefined the dynamic microphone with superior wide frequency response, the lowest presence of noise in the industry, flawless design, and elite quality expected by an innovator and leader in the field. Your ribbon microphones will now be jealous. PR-30-B Professional Dynamic Microphone, matte black finish, with red mesh grill - Allow 7-10 days for shipment. Heil PR-20: The Heil PR-20 represents completely new dynamic microphone technology designed for a wide range of professional applications such as live sound, commercial broadcast, and sophisticated recording. Its wide frequency range outperforms the tired, 30+ year old industry technology and can withstand huge amounts of SPL. The end result is a microphone that can answer the call to any application. For example, the gorgeous upper mid range makes the PR-20 the absolute best live vocal microphone, while its outstanding frequency response and superb dynamic range suit it perfectly for use with a snare drum. Since 1982, Heil Sound has been the leading manufacturer of communications microphones and has a paramount understanding of phasing. When properly applied, this knowledge creates outstanding cardiod patterns with unbelievable rear rejection that removes unwanted sounds that try to enter from the off axis rear. The pattern control of the Heil PR-20 is outstanding. This exceptional performance is achieved by using the ideal combination of materials for the large low mass diaphragm and a special mixture of neodymium, iron, and boron that gives the PR-20 the strongest magnet structure available. In addition to the special magnet structure, the PR-20 achieves its exceptional performance by using a large 1 1/8" low mass voice coil assembly. Special attention has been paid to the phasing plug assembly with equally placed ports that sense audio from behind, entering them out of phase. Thus, the PR-20 produces a very linear cardiod pattern and reduces the proximity effect while achieving perfect articulation. This new Heil element is usable in extreme high sound pressure levels and is immune to overload conditions making it perfect for vocal and live sound applications. The Fin: The Heil Sound Fin utilizes the PR-20 element so popular in the professional audio realm, and it�s housed in a gorgeous high-gloss chrome-finish enclosure reminiscent of the gorgeous Heritage microphone.If phantom power* is provided to The Fin, the wind screen becomes illuminated by four imbedded LEDs, adding to the art deco appearance of this great sounding microphone. Its "Cool Factor" is without peer! Note: The phantom power requirement for The Fin is not compatible with Icom transceivers� voltage. The Heil Heritage a stylish dynamic microphone with a vintage look that is equally at home in live sound, recording, and broadcast applications. The exceptional performance is achieved by the use of a special magnet structure with a large 1-1/4" aluminum low mass voice coil assembly similar to the Heil PR 22. The frequency response is 50 Hz - 18 kHz with a mid range boost at 4 kHz, which results in incredible brilliance and presence. Special attention has been paid to the phasing plug assembly with equally placed ports that sense audio from the back of the microphone entering those sounds out of phase. The result is a tight cardioid pattern with superior rear rejection. The Heritage has a slide switch that turns the audio on and off and has a small lock screw that can lock it in position. The Heritage comes in two finishes; chrome with blue, and black matte with blue. The chrome finish is a special �show chrome� where the steel body is copper plated and then double chrome plated producing a deep chrome finish. A molded internal foam windscreen inside the grill covers the Heil dynamic microphone element mounted in a specially tooled rubber shock mount. Standard 5/8"-27 microphone stand threads allow The Heritage to be mounted on booms or floor stands. We carry Heil's full product line but only have the most common items listed here. If you don't see what you are looking forE-mail sales and one of our experienced staff will respond with pricing and availability.